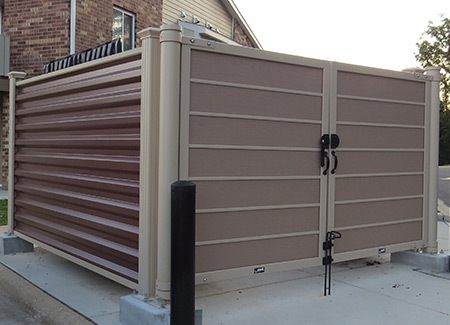 Whether it’s retail, municipal, commercial, or multi-family residential, your building needs a dumpster. Traditionally, you might have used CMU with some type of gate, “because that’s what we’ve always done” (the most expensive words in business). Time for a change. 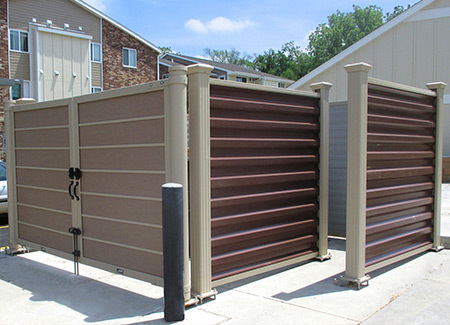 Covrit Dumpster Enclosures are elegant (even though we know what they’re concealing), durable, and made to order. Check out your design options below. This is one of our favorite projects. Look how it turned out! 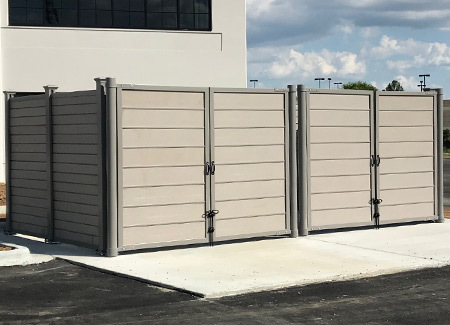 This ground screen, along with enclosures for a generator, HVAC unit, and three dumpsters were custom designed to coordinate with the look of a new senior living facility in Strongsville, OH. 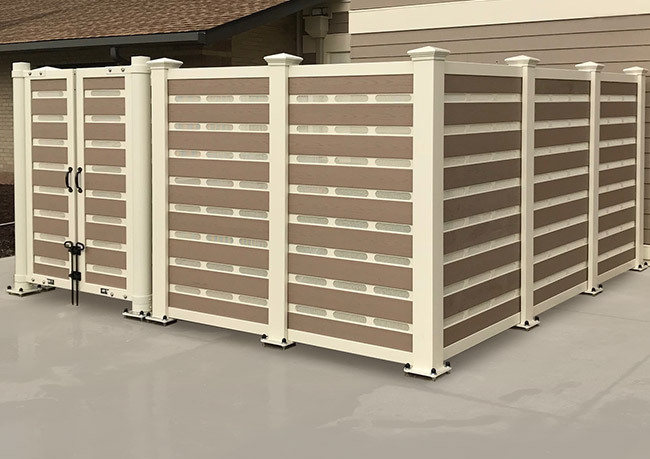 It’s no accident that these enclosures enhance their surroundings. 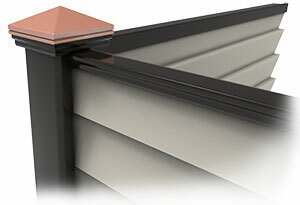 We color-matched the posts, frames, and vented aluminum stiffeners to the color of the exterior trim. 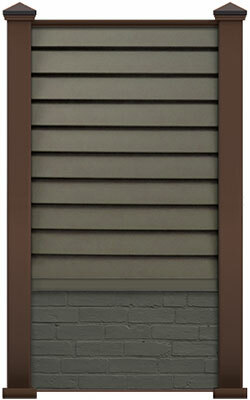 The Plankwall in Brownstone provides a seamless complement to the surrounding landscape and building facade. We like this project so much, our manufacturing team has a photo of it posted at their workspace! 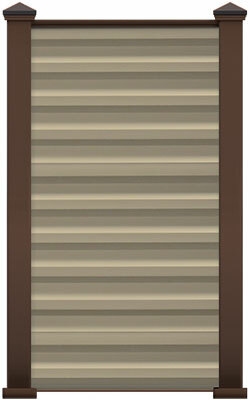 Style: Custom Horizontal Plankwall with Vented Aluminum Stiffeners. 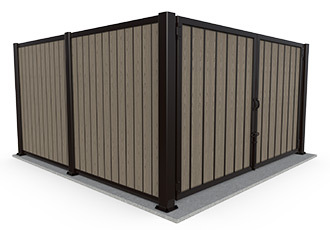 The purpose of a Dumpster Enclosure is to hide or contain trash from sight. 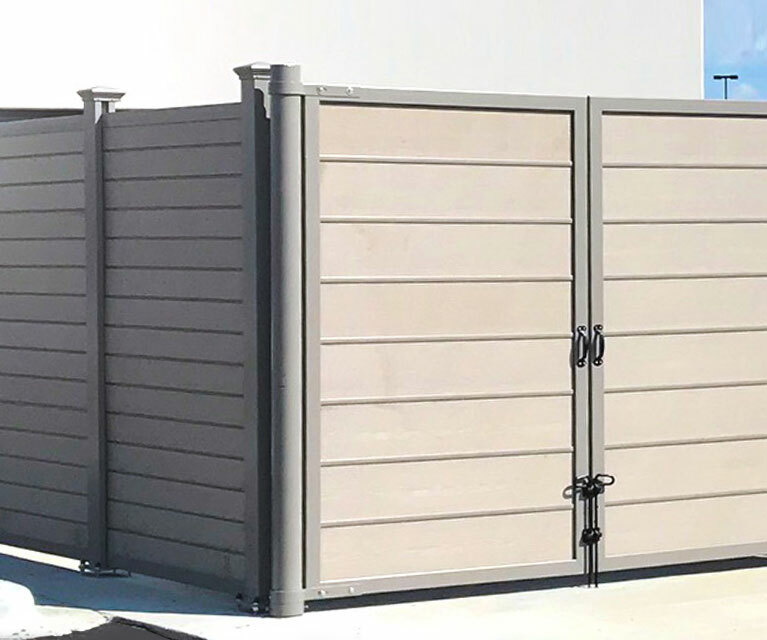 Care should be taken to ensure you have adequate room on all sides of the dumpster as well as enough height to conceal the top of container. 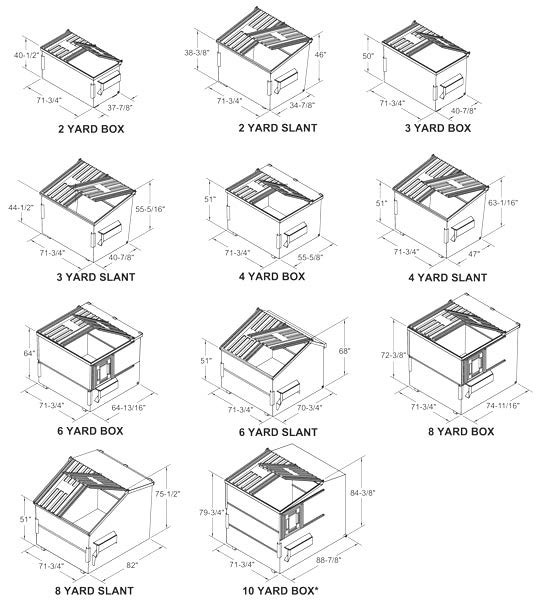 Use the table below as a guide to selecting the best size enclosure. 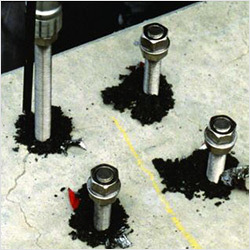 Note: For multiple unit enclosure, multiply the length times the number of units. 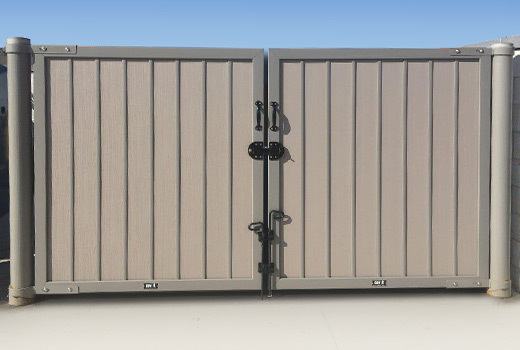 *Walk-in style enclosures allow access to the side opening on the dumpster without the need to open the main gates. 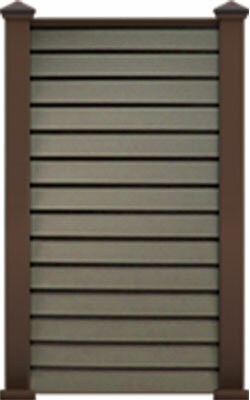 Commonly utilized in mixed used, retail, apartment and condo applications. Our customers have great taste. 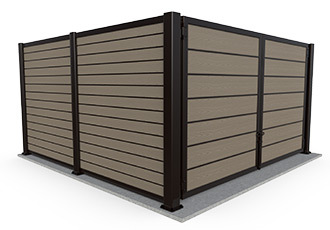 Our most specified enclosures continue to be PlankWall, in both vertical and horizontal, with either Mission or Madison gates. 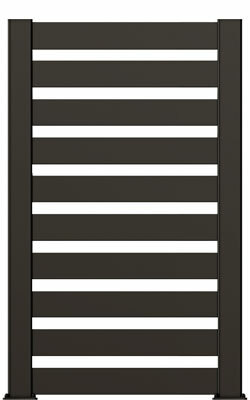 As far as size, single and double enclosures are most common. Whether they’re modern or rustic, sleek or trendy, your designs are unique and timeless. PlankWall is too. Gates only? A unique solution? 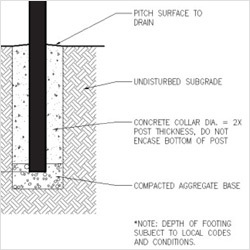 Do you have an existing structure or does building code require brick? ToughGate Gates and Doors have you covered without worrying about custom build. Your project design might be missing some privacy or a way to hide something besides a dumpster. 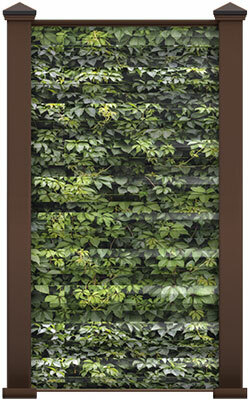 Get creative with Covrit Screens and Walls. Got this far and still haven’t seen what you need? Continue down the page for style options or contact our team and we can help. Look closely. Touch it. Tap on it. 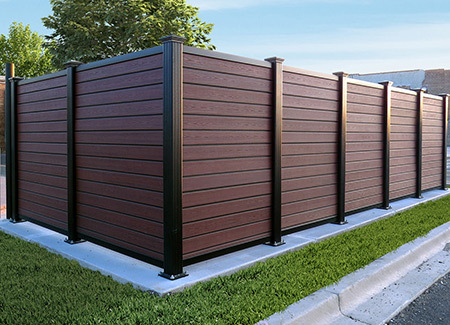 Those might be odd recommendations for a dumpster enclosure, but this PlankWall material feels and looks like wood-grain without the up-keep of real wood. That means resistance to stains, mold, and mildew. No maintenance. PlankWall is engineered to last and enhances any building design. 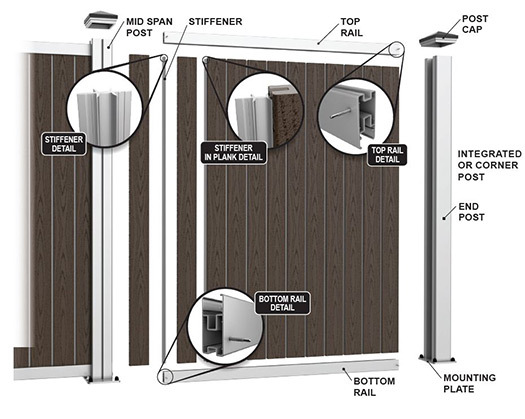 The “industrial look” is in style and metal series dumpster enclosures only amplify it. From a manufacturing facility to a new build with a metal façade, this panel option is sleek and modern, just like your design. 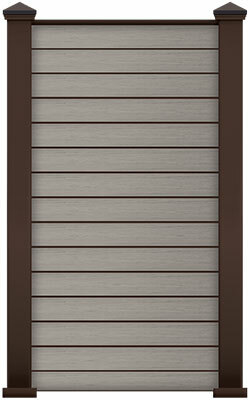 We’ve also introduced Slat Wall, a stylish addition to the metal series family. For current color availability, contact a Project Manager. 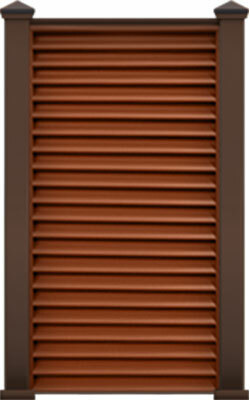 Ask about our standard colors or provide a PMS, RAL or any other color code. 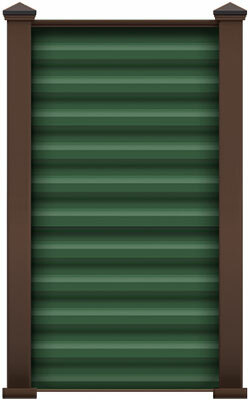 It’s both versatile and durable. 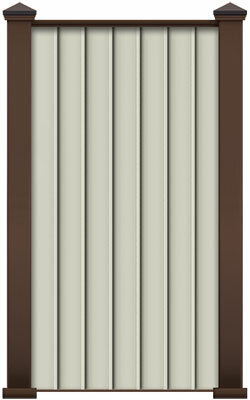 The Acrylicap ABS panels are colored throughout and shaped using vacuum forming in a variety of styles. Customers may also choose to print graphics to the material. 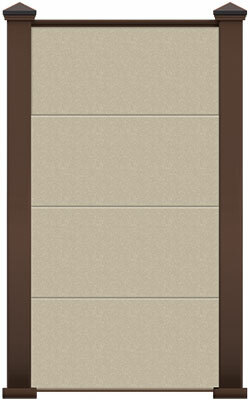 *This infill style is limited in size to 90” high and 40” wide.